TROMSOE, Norway — Indigenous Sami peoples in the Arctic may have found a way to help their reindeer herds cope with climate change: more castration. Alissa de Carbonnel / AFP - Getty Images Reindeer herds like this one in Lovozero, Russia, are part of the native Arctic culture. XBRIDGE, Canada, Jan 28, 2011 (IPS) – The world’s northern freezer is on rapid defrost as large volumes of warm water are pouring into the Arctic Ocean, speeding the melt of sea ice, according to a new study. Surface temperatures in parts of the Arctic have been 21 degrees C above normal for more than a month in recent weeks. “Boats were still in the water during the first week of January,” said David Phillips, a senior climatologist with Environment Canada, referring to southern Baffin Island, some 2,000 km north of Montreal. This is a region that receives just four or five hours of weak sunlight during the long winter. Temperatures normally range from -25 to -35 degrees C but were above zero on some days in January. “It’s impossible for many people in parts of the eastern Arctic to safely get on the ice to hunt much-needed food for their families – for the second winter in a row,” Phillips said in a report. The warming and melting of the Arctic is happening much faster than expected and new data reveals that huge volumes of warmer water from the North Atlantic are now flowing into and warming up the Arctic Ocean, researchers reported Friday in the journal Science. “In the past hundred years the waters in the Fram Strait have warmed about two degrees C,” says co-author Thomas Marchitto, of Colorado University’s Institute of Arctic and Alpine Research. The Fram Strait between Greenland and Svalbard (Spitsbergen) is the major connection between the Arctic Ocean and the world ocean. An international team of researchers analysed marine sediments and found that temperatures of the northward inflowing Atlantic water varied by just a few tenths of a degree Celsius during the past 2,000 years. However, in the last hundred years temperatures have shot up by two degrees C.
“What’s happening here is very unusual compared to the last 2,000 years,” Marchitto told IPS. Climate change is believed to be behind this warmer water because over 90 percent of additional heat trapped in the atmosphere from the burning of fossil fuels like coal, oil and natural gas is going into the oceans, he said. “The accelerated decrease of the Arctic sea ice cover and the warming of ocean and atmosphere in the Arctic, as measured during the past decades, are in part related to an increased heat transfer from the Atlantic,” said co-author Robert Spielhagen, a palaeoceanographer at the Academy of Sciences, Humanities and Literature in Mainz, Germany. Sea ice has declined dramatically during the short Arctic summers in recent years, with some experts now projecting that the ice cover will be essentially gone in as little as five years. Just a few years ago, no one thought a summer ice-free Arctic could happen before 2060. The warming Arctic and melting sea ice is a planetary-scale change since the Arctic Ocean covers 14 million sq km, an area almost as big as Russia. The Arctic and Antarctic polar regions are key drivers of Earth’s weather and climate. The rapid defrosting of the Arctic has already altered the climate system, researchers now agree. IPS previously broke the story revealing that the snow and cold in the eastern United States and Europe during the winter of 2009-10 was likely the result of the loss of Arctic sea ice. The same thing has happened this year. As more and more sea ice melts, there is more open water to absorb the summer sun’s heat. A day of 24-hour summer sun in the Arctic puts more heat on the surface of the ocean than a day in the tropics, James Overland of the NOAA/Pacific Marine Environmental Laboratory in the United States told IPS. That extra heat in the ocean is gradually released into the lower atmosphere from October to January as the region slowly re-freezes months later than normal. This is a fundamental change – a large part of the Arctic Ocean is radiating heat instead of being cold and ice-covered. That has disrupted wind circulation patterns in the northern hemisphere, reported Overland and other researchers at the International Polar Year Oslo Science Conference in Norway last June. The result: the Arctic stays warm and mid-latitude regions become colder and receive more snow for much of the winter. Last December was the coldest south Florida has experienced in more than a century of record-keeping. Most of Britain suffered through its coldest December ever. Up in the Arctic, Coral Harbour on the northwest corner of Hudson Bay was above zero degrees C for two days in early January for the first time in history. Much of the eastern Arctic centred around Baffin Island averaged +21C above normal between Dec. 17 and Jan. 15 this year. This looks to be the new normal since Arctic experts agree the melting sea ice is now locked into a death spiral. “In future, cold and snowy winters will be the rule rather than the exception” in the eastern United States and Europe, Overland previously told IPS. This week the U.S. northeast suffered through its sixth major snowstorm this winter, breaking all snowfall records. Nansen-Amundsen-året ble offisielt åpnet i Tromsø 23. januar ved at Terje Isungset spilte på 100 år gammel is fra Sydpolen. Instrumentet, som han kaller sørpolofon, bestod av fire issylindre av ulik lengde med en diameter på 8-10 centimeter. De var montert etter xylofon-modellen på en resonanskasse av is, og han spilte på dem med mindre isklkubber. Sørpolofonen tålte ikke mildværet i Tromsø, og sylindrene ble tydeligvis ganske porøse av en halvtimes venting etter lydsjekken. De hadde mista en del klang, og brakk opp under sydpollåten, som isflak i vårsola. Det var likevel en stor opplevelse å høre og se dette instrumentet. Kanskje akkurat disse snøflakene landet på Amundsens bare hode da han hilste flagget ved polpunktet? Det var en flott konsert Isungset leverte sammen med sangeren Lena Nymark. De har funnet en nydelig formel med klangfull isperkusjon og lett, spretten kveding. Lena Nymark (sang) og Terje Isungset (Svalbard-is). Isungset hadde mer gammel is i å by på. En annen melodisk-perkusiv variant var biter av 500 år gammel is fra Svalbard, som han hadde plassert på et isbrett og spilte på med andre gamle isbiter. Han spilte også på hengende stemte isplater av klar is, som med en smule delay gir lange, dype og varme toner. Til slutt, eller var det midt i, tok han opp isluren, og blåste kalde, rå og forlokkende toner, som vindens evige jag over polisen. Med vakker sang og lyden av arktis og antarktis ble det en konsert verdig en polfarer eller to. Isungset er en kreativ musiker og instrumentmaker, og bringer tradisjonene fra Amundsen og Nansen videre i sin utforskning av isens musikalske egenskaper. Det er underlige og vare toner han får ut av istrumentene. Enkelt, skjørt, evig og uhørt. Fra venstre: isperkusjon, islur, Svalbard-is og hengende isglockenspiel. Tromsøs ordfører Arild Hausberg og Norges utenriksminister Jonas Gahr Støre bidro også under åpningen. Hunters in Iqaluit may not get to hunt more polar bears this year after all, as the group representing them has to deal with several levels of bureaucracy over the 2011 hunting quota. 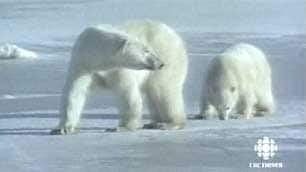 Last week, the Amarok Hunters and Trappers Association in Iqaluit announced a big increase in the annual number of polar bears its members can hunt, from the usual quota of 23 bears to 41 in 2011. The organization attributed the increase to “credits” it received from wildlife regulators for staying below the quota in past years. But Amarok officials have since learned they do not yet have permission to use all those credits. Vice-chair David Alexander told CBC News he blames the confusion on miscommunication between many decision-making bodies. The Qikiqtaaluk Wildlife Board has approved adding only 10 extra polar bears to Iqaluit’s annual hunt, bringing this year’s quota to 33. Nunavut government officials said they support the Qikiqtaaluk board’s decision, but it’s now up to the Nunavut Wildlife Management Board to give its final approval. “We have to send out the letter to the right appropriate people, which is the Nunavut Wildlife Management Board, as well as with the Nunavut government,” Alexander said Wednesday. The Nunavut Wildlife Management Board said it has yet to receive an application from the Amarok Hunters and Trappers Association. A UN report examining the human rights situation of Sami people in Sweden, Finland and Norway calls on the Nordic states to provide Sami parliaments with more funding to help boost general knowledge of the indigenous Arctic people, their language and their culture. Minority languages in Europe are protected by the European Charter for Regional or Minority Languages, which was adopted by the Council of Europe in June 1992 and came into force in 1998. It seeks to promote threatened languages as part of Europe’s cultural heritage and facilitate their use in daily life. Article 22 of the European Charter of Fundamental Rights states that “the Union shall respect cultural, religious and linguistic diversity”. The report notes that overall, each of the Nordic countries pays a high level of attention to indigenous issues, but that more remains to be done to ensure that the Sami enjoy the full range of rights that are guaranteed to indigenous peoples. Drafted by the United Nations’ special rapporteur on the situation of human rights and fundamental freedoms of indigenous people, James Anaya, the report pays particular attention to efforts “to revitalise Sami languages and provide children and youth of that minority with an appropriate education”. The special rapporteur calls on Nordic countries to provide “immediate and adequate funding” to Sami parliaments to assist in the implementation of concerted measures toward these ends. In parallel, Anaya suggests that “the states and the Sami parliaments should cooperate to develop and implement measures to increase awareness about the Sami people within the media and the public at large,” including in school curricula. According to the report, the media often portray Sami stereotypes, which contribute to their negative image in society. The Sami people – estimated to number 70,000 to 100,000 – traditionally inhabit a territory spanning the northernmost parts of Europe, including Norway, Sweden, Finland and Russia’s Kola Peninsula. Despite national borders, they continue to exist as one people, united by cultural and linguistic bonds and a common identity. There are nine language groups divided across national borders, but the UN report notes that the wide variety of Sami languages is actually decreasing. Sami people do not generally speak the language outside home and those who do speak it are spread out over large areas, contributing to the loss of their linguistic heritage. UN rapporteur Anaya notes that unlike Norway and Finland, there is no legislation in Sweden that specifically protects the Sami language. In Sweden, the language is granted special protection within certain designated “administrative areas,” but the municipalities that make up the Sami administrative area have difficulty complying with their obligations “due to a lack of Sami-speaking staff and a reported negative public attitude towards the minority”. While the Finnish Constitution guarantees the rights of Sami people to maintain and develop their own language and culture, “as a practical matter, these legal protections are not implemented, due in a large part to the lack of knowledge of municipal and national state authorities in Sami languages”. Even within the Sami heartland in Finland, access to social and healthcare services in the Sami language is described “as a matter of chance”. One common feature in all Nordic countries is that Sami students may study in the Sami language within designated Sami areas, which are defined by law. But the problem, notes Anaya, is that some 50% of Sami people, and 70% of children under the age of 10, live outside these areas. The fragmentation of Sami settlements and a shortage of teachers present a problem for education in the Sami language and culture, and there is also a shortage of education materials. And while some measures have been taken to facilitate long-distance learning, at least in Finland, these programmes have experienced problems, primarily due to a lack of funding, according to the report. FAROE Petroleum has been offered three new prospective drilling licences in the Norwegian Sea. The Aberdeen-based oil and gas independent struck oil at the Maria and Fogelberg fields off the coast of Norway last year. The company is the largest shareholder in the Maria site with a 30 per cent stake. Faroe has now secured three new prospective licences in the Norwegian Sea under the 2010 Norwegian APA Licence Round. The new licences include an extension of the Maria site which is estimated to have up to a million barrels of recoverable oil. Faroe will take a 30 per cent stake in the field extension, as well as a 30 per cent stake in the Milagro field north of the Maria discovery. The company will also take a 50 per cent stake in the Grayling field north of Faroe’s major Fogelberg discovery last year, which has estimated recoverable oil reserves of between 19 and 95 million barrels of oil equivalent. Graham Stewart, Faroe’s chief executive, said: “Faroe Petroleum is very pleased to have been awarded these prospective licences in the 2010 Norwegian APA licensing round. “As well as continuing our successful relationships with Wintershall and Centrica, we have also been awarded substantial equity interests in each licence. Listen live on the Internet to what’s going on under the Antarctic sea-ice. The Alfred Wegener Institute’s PALAOA underwater acoustic observatory has made this possible for over five years. The acoustic observatory has been continuously recording sounds under the ice near Neumayer Station since 28 December 2005. It provides the world’s longest time series of civilian acoustic measurements, enabling researchers to study the presence and behaviour of animals under the Antarctic ice. This has led to many new findings on the distribution and behaviour of several whale and seal species. Recording the underwater calls of marine mammals is one of the most promising methods to study distribution and seasonal migration of these animals in the ice-covered Antarctic. Visual sightings of marine mammals in Antarctic waters are rare since human access is limited and animals only occasionally surface to breathe. Acoustic recordings, on the other hand, can be made year round. By means of the PALAOA observatory, ocean acoustics experts from the Alfred Wegener Institute for Polar and Marine Research in the Helmholtz Association have discovered that leopard and Ross seals populate Antarctic waters near Neumayer Station III. For many sounds it is now known by what species they are produced and, in some cases, in what type of behavioural context they are produced. Such acoustic data can be used to derive information on the timing of mating and reproduction of the various species. Acoustic behaviour of leopard and Ross seals, for instance, shows that both species also reproduce in coastal Antarctic waters. Previously this was only known for Weddell and crabeater seals. Inter-annual comparisons of acoustic data indicate that the timing of reproduction is linked to the availability of certain types of ice on which the animals give birth to their young. “Some seal species actually are acoustically present in the PALAOA recordings in the same calendar week every year,” Dr. Ilse van Opzeeland describes the surprisingly exact timing of the animals. Researchers at the Alfred Wegener Institute were astonished to hear humpback whales on the edge of the Antarctic continent, even in austral winter. The observatory has also recorded calls of Antarctic blue whales, thereby refuting the existing presumption that the largest animals living on Earth avoid ice-covered waters. Even 50 years after the end of commercial whaling in Antarctica very little is known about the long-term population development of these nearly exterminated giant whales. Traditional counts based on sightings often record only a few of these marine mammals during an expedition over several months. The PALAOA data, on the other hand, contain blue whale vocalisation almost every day because the calls of these animals have a very great range extending to several hundred kilometres. Such information is extremely important to gain a general understanding of the behaviour, size and recovery of the stocks of large whales, which are still endangered in a variety of ways. The loudest sounds recorded by PALAOA stem from iceberg collisions. About once a year giants the size of Berlin bump into each other or into the edge of the ice shelf. These create quite a racket in the Bremerhaven offices of the ocean acoustics specialists, whose daily work is accompanied by the live sounds from the Antarctic. Aside from their usefulness for research, the extraordinary sounds from the Antarctic Ocean have also found their way into radio and television as well as into the works of musicians, composers and creative artists. In 2010 more than three million visitors saw and heard the walk-on sculpture and sound installation “Iceberg PALAOA” floating on the Ruhr River in Essen – it represented one of the highlights of the European Capital of Culture “RUHR2010”. PALAOA stands for PerenniAL Acoustic Observatory in the Antarctic Ocean and also means “whale“ in the ancient Hawaiian language. It is the only hydroacoustic observatory in the immediate vicinity of the Antarctic continent, or more exactly on the Ekström Ice Shelf in the eastern Weddell Sea at 70°31’S 8°13’W. In December 2005, several hydrophones and sensors were positioned under the ice through holes drilled through the floating, 100 meter thick ice shelf around 25 kilometres north of the German Neumayer Station. Continuous recording of the underwater sounds for a period of several years enables unique acoustic observation of the underwater animal world. The recordings are made year-round and enable comparisons of the acoustic environment between years. In terms of energy, PALAOA is self-sufficient: solar cells and a wind generator supply the observatory with renewable energy 90% of the time. During the months of darkness in the Antarctic winter and at temperatures down to 50°C, a fuel cell driven with methanol springs into action on windless days to guarantee continuous operation. The acoustic observatory has recorded more than 30,000 hours (6 terabytes) of data in the past five years and registers a broad range of frequencies. This means PALAOA detects the low-frequency sounds of blue whales as well as the high-frequency clicks produced by orcas, that function as a biological echo sounder for orientation. Alongside acoustic data, oceanographic data, the movement of the ice shelf and sea ice and local shipping traffic are recorded in order to study their influence on the behaviour of the large marine mammals. Researchers hope to collect data for several more years until the ice shelf on which PALAOA is located breaks off and moves around the southern continent as a drifting iceberg. The Alfred Wegener Institute conducts research in the Arctic, Antarctic and oceans of the high and mid latitudes. It coordinates polar research in Germany and provides major infrastructure to the international scientific community, such as the research icebreaker Polarstern and stations in the Arctic and Antarctica. The Alfred Wegener Institute is one of the sixteen research centres of the Helmholtz Association, the largest scientific organisation in Germany. ﻿39 companies have recieved offers for 50 new production licences on the Norwegian continental shelf. ﻿Of the 50 production licences, 31 are locate in the North Sea, 17 in the Norwegian Sea and two in the Barents Sea. Statoil has committed to compression for three of its main gas production centers on the Norwegian shelf. It aims to prolong output from existing fields under development, and to prepare the facilities for new roles as regional hubs. The largest project in monetary terms is a subsea compression system for the Åsgard field complex on the Haltenbanken in the Norwegian Sea, where water depths range from 240-310 m (787-1,017 ft). Aker Solutions has the $552-million equipment contract, which includes a subsea compressor manifold station and template, three compressor trains, electrical control systems, HV power distribution, and topside tie-ins. In the same region, Statoil has put a tag of $368 million on its plan to install a new compressor module on the Kristin platform, designed to introduce lower pressure production. This, the company says, will lift reserves recovery from the Kristin and Tyrihans fields by up to 115 MMboe, and will extend life from these fields and others in the area through 2029-2034. The new equipment should be installed during summer 2013, entering service the following spring. Finally, in the North Sea, Bergen Group Rosenberg will build and install a compressor module on the Kvitebjorn platform. Statoil describes this as a “pre-compression” project, allowing for production with reduced wellhead pressure. Fabrication is under way on the gas turbine-driven compressor, which should be installed between 2012-2014. Gas from Kvitebjorn is piped to Kollsnes in western Norway. Bergen Group’s $161-$242-million contract includes an option for tie in of a condensate pipeline to the Valemon platform, also currently under construction. Major operators in the UK central North Sea have embarked on incremental developments. Total plans to install a new platform on the West Franklin field in blocks 29/5b and 29/4d in the high-pressure/high-temperature gas-condensate region. The aim is to produce 85 MMboe of fresh reserves via a new platform and initially three wells, which will be linked to the existing Elgin/Franklin production facilities. Total estimates the cost at $1 billion, and expects to deliver 40,000 boe/d when the platform starts up in 2013. Apache Corp. has ordered a new satellite oil production platform for mid-2012 for the Forties field, which will be bridge linked to the Forties Alpha platform. OGN Group’s Hadrian Yard close to Newcastle in northeast England, will build the facility under a $242-million contract. It will provide Apache with 18 new slots for drilling development wells, along with HP gas compression for artificial lift and dehydration. Apache estimates Forties has a further 173 MMboe of remaining proved reserves, and is looking to maintain daily oil output at around 60,000 b/d through 2013 and beyond. AMEC, which used to run Hadrian, will manage modifications to Forties Alpha. In the Danish North Sea, Hess and its partners DONG Energy, Noreco, and Danoil have approved a Phase III development of the South Arne field in license 07/89. The proposed scheme, designed to extract a further 15 MMboe, involves drilling and stimulation of 11 new wells, and adding two new wellhead platforms to the north and alongside the existing South Arne facility. One of the first contracts to be awarded was a pipeline bundle, which Subsea 7 will fabricate and install in 2012, linking the two new platforms. The field is in a water depth of 60 m (197 ft). DONG recently made a new oil discovery in the Solsort prospect in license 4/98, drilled by the Maersk Resolute. Three side tracks also were drilled to define the limits of the find, all with positive outcomes. Lundin Petroleum says its recent oil discovery well on the Apollo prospect in the Norwegian North Sea could be in the range of 15-65 MMboe. Well 16/1-4 was drilled by the Transocean Winner on license PL338 to target an extension of the Jurassic reservoir associated with Det norske oljeselskap’s Draupne find. But results suggest only a limited part of Draupne extends into the license. At the Palaeocene (Heimdal formation) and Cretaceous levels, two oil columns were encountered. The well also penetrated 60 m (197 ft) of good-quality Cretaceous sands below the oil-water contact, suggesting potential up-dip of the discovery. It is not clear, however, whether Apollo could feature in Lundin’s plan for the Greater Luno Area development, which is expected to go forward later this year. Providence Resources has become operator of the Barryroe oil discovery in the North Celtic Sea off southern Ireland. The company says the partners will commission a new 3D seismic survey early in 2011, the results of which will help preparations for an appraisal/pre-development well. Discussions are under way with other consortia on the Irish shelf concerning a rig slot. Independent analysts have estimated the field’s recoverable contingent resources at 59-144 MMbbl. Barryroe’s crude is waxy, and its reservoir architecture is complex, but Providence says this could be addressed via horizontal, artificially lifted well completions. Providence also operates the 1981 Spanish Point discovery in 400 m (1,312 ft) water depth, 170 km (105 mi) off western Ireland in the Porcupine basin. Newly interpreted 3D seismic and wide-ranging modeling studies suggest 100-200 MMboe could be recoverable. Field development could involve drilling six to 14 fracture-stimulated wells, with potential plateau production of 30,000 b/d of oil and 250 MMcf/d of gas. In the St. George’s Channel basin separating Ireland from Wales, the company has signed an optional agreement whereby Star Energy would farm into 50% of Standard Exploration License SEL 1/07. The permit is in 90 m (295 ft) water depth, and contains the mapped extension of Marathon’s 1994 Dragon gas discovery offshore west Wales, and the deeper-lying Orpheus and Pegasus prospects. Star would earn the farm-in right by conducting subsurface studies on Dragon, then participating in an appraisal well. Fluorspar and gold miner Tertiary Minerals plc said a drilling rig is being mobilised this week to its Kiekerömaa gold project in the Lappland Greenstone Belt in northern Finland. Drilling will test the Kiekerömaa gold mineralised zone previously discovered by Finnish company Outokumpu in 1997. Eight holes are planned over a 300m strike length, subject to initial drill holes achieving acceptable core recovery. Drilling is expected to take four weeks with assay results becoming available eight weeks after completion. Chairman Patrick Cheetham said, ‘Whilst our key focus is on the objective of becoming a major European supplier of fluorspar, a portion of the funds recently raised has been reserved for drilling on the company’s gold projects. ‘The gold mineralised zone at Kiekerömaa has not been tested by diamond drilling until now and the swampy ground requires that it be drilled in winter when the ground is frozen. Shares were up 0.5p at 11.75p.